Problems with DMG appearing not to mount. Sometimes when you download the MacVector disk image and try to mount it nothing appears to happen. Generally this is because although it has been mounted a Finder window has not popped up. It also affects those of us with messy desktop (not me of course!). If you have many files then you might miss the MacVector CD icon. The default behaviour for when you mount a disc image file (DMG) is to show a Finder window with that mounted DMG. However, this is configurable and not from an obvious place. 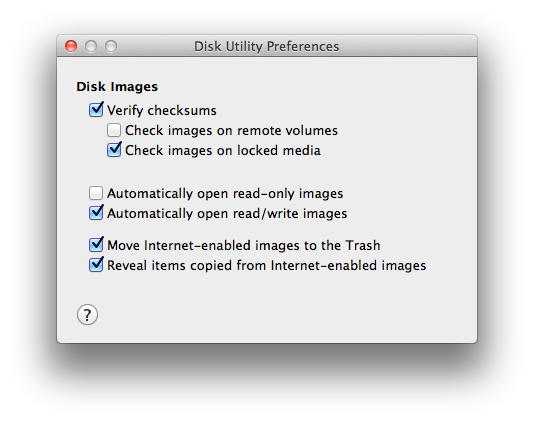 You need to launch Disk Utility and go to PREFERENCES. Ensure it’s selected to “AUTOMATICALLY OPEN ……..”. Do that and remount your DMG and it will appear. This entry was posted in Tips and tagged OSX. Bookmark the permalink. Both comments and trackbacks are currently closed.